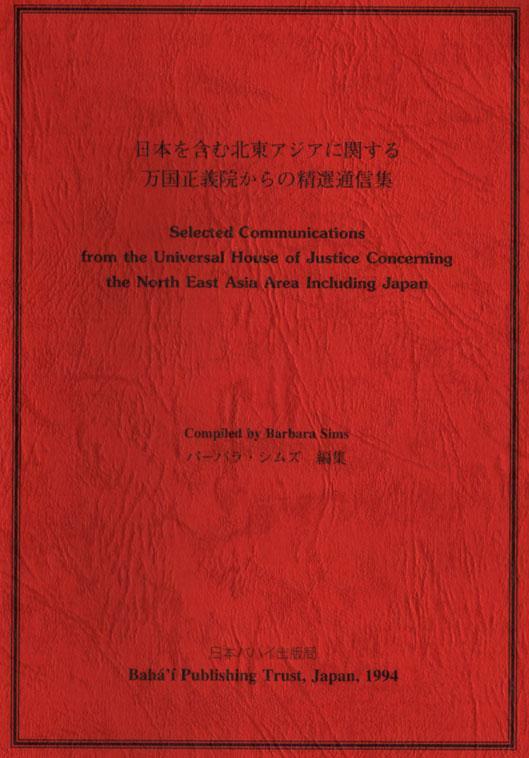 Compilation of letters from, or on behalf of, the Universal House of Justice, in both English and Japanese. compiled by Barbara R. Sims. At Ridván 1957 the National Spiritual Assembly of the Bahá'ís of North East Asia was elected. Its formation, along with several others, was one of the goals listed by the Guardian in his monumental Ten Year Crusade. At that time thirteen new National Spiritual Assemblies were elected making a total of twenty-six in the world. The National Spiritual Assembly of North East Asia was one of the new ones. The Guardian wrote (April 1, 1957) that the most important were in the Pacific area; in Tokyo, Djakarta and New Zealand. The National Spiritual Assembly of North East Asia was the only National Assembly in the northern Asia area. It was a regional assembly and embraced Japan, Korea, Taiwan, Hong Kong, Macau, Hainan Island and Sakhalin Island. However, the Guardian designated that Tokyo would be the seat of that Assembly, thus endowing Japan with importance. Four of the areas were Chinese, one Japanese, one Korean and one Russian. The Chinese area of Hong Kong was under British rule, and Macau under Portuguese rule. Both were leased from China and their return was forthcoming. At that time there was no access to the Russian island of Sakhalin nor to Hainan Island, off the coast of mainland China. Those two areas were taken out the jurisdiction of North East Asia but remained as goals to open. A Chinese Bahá'í from Macau, Mr. John Chang, was able to spend two weeks in Hainan in 1959 thus opening that island. The opening of Sakhalin remained a goal of the National Spiritual Assembly of North East Asia, and later, the National Spiritual Assembly of Japan and was fulfilled in 1990. In 1974 the National Spiritual Assembly of Japan was elected. Although it was the first convention of the Bahá'ís of Japan, actually it was the 18th annual convention in Tokyo. Only the name had changed. Where a few years earlier there had been one assembly, there were now four; Korea (elected in 1964), Taiwan (elected in 1967), Hong Kong with Macau under its jurisdiction (elected in 1974), and Japan. We were very sad to see the demise of the old National Spiritual Assembly of North East Asia. We recalled that the Guardian had been pleased with that first Assembly in northern Asia, elected in 1957. A letter written on his behalf commented, "The formation of this new Regional Assembly, whose area of operation is so vast and situated in such an important part of the globe, has been a source of joy to the Guardian. He was also very happy to see that your Assembly has represented on it members of the three great races of mankind, a living demonstration of the fundamental teaching of our Holy Faith..."
House of Justice in 1963, the Hands of the Cause gave the Bahá'í world the guidance it needed. With the election of the Universal House of Justice a new era began for the Bahá'í world. In this booklet we have listed some of the guidance given to our area by the Supreme Body. To the National Spiritual Assembly of the Bahá'ís of North East Asia, July 20, 1963. Thank you for sending the minutes of your first meeting of 26th May, 1963. We pray ardently in the Holy Shrines that your Assembly may be an instrument of guidance for the peoples of that part of the world who have proved to be very much receptive in accepting the Cause of God. We are sure that your future minutes will reflect a great deal the magnificent efforts which are being exerted in the field of mass conversion. The success we had recently in Korea and more recently in the Philippine Islands is an encouraging sign heralding a bright future in those regions. Frequently in the writings of the Master and the beloved Guardian, we come across prophecies regarding Japan and the countries of the Far East, and we are sure that through united, determined and systematic efforts, all these promises will be fulfilled, and the people from the yellow race will have their due place among the enrolled supporters of the Greatest Name. We hope that your Assembly will devise ways and means to have regular and continuous communication with all Centres under your jurisdiction so that your communications with the friends will surely encourage them more than ever before to arise in the service of the Cause, and to bring about the victories so dear to the heart of the beloved Guardian, particularly in the field of mass conversion. We assure you of our prayers in the Holy Shrines. To the National Spiritual Assembly of the Bahá'ís of North East Asia, October 23, 1963. By now you have received our message listing the new National Spiritual Assemblies which will be created at Ridvan 1964. We hope that this news will provide the friends with a spring-board from which we can successfully launch the complete Nine-Year Plan. If the Plan is to be successful, however, we must be assured that all of those areas listed in our message are strong enough to support the weight of each new pillar for the Universal House of Justice. Therefore, your Assembly should take immediate steps to assure the consolidation of all of those areas under your jurisdiction. We call particular attention to Korea. To the Bahá'ís of North East Asia, April 1964. The Bahá'í Community of North East Asia, founded during the Ministry of `Abdu'l-Bahá, was much beloved by Him and honoured by many Tablets addressed to Japanese believers. May this Community fulfil every hope cherished for it by `Abdu'l-Bahá and grow to become a beacon of divine illumination to the whole of Asia. To an individual in Japan, February 9, 1970. We share your hope that the day will soon come when Japanese believers themselves can assume greater responsibility for the growth and development of the Faith in their country. In this regard the purpose of all pioneers should be to provide opportunities for native believers to become active in the administration of the Cause. We are certain that greater participation by native believers will produce a tremendous momentum which will ultimately bring about a fulfillment of the prophecies in the Writings about their country. To the National Spiritual Assembly of the Bahá'ís of North East Asia, March 7, 1971. Your region is very close and dear to us. As you know, Japan is linked with the Heroic Age through the early teaching work of the Hand of the Cause Agnes Alexander, and is mentioned several times in the Tablets of the Divine Plan. Speaking of Miss Alexander's work, the Master said, "I declare by the Lord of Hosts that had this respected daughter founded an empire, that empire would not have been so great! For this sovereignty is eternal sovereignty and this glory is everlasting glory." To the Friends of God Assembled in the Conference of the North Pacific Ocean, September 1971. On the eve of the Fiftieth Anniversary of the opening of the Formative Age of our Faith we call to mind the high hopes often expressed by the beloved Master for the spread of the Cause in this region, His mention in the Tablets of the Divine Plan of many of the territories represented in this Conference, and the faithful and devoted services of that maid-servant of Bahá'u'lláh, the Hand of the Cause Agnes Alexander, who brought the Teachings to these shores in the early years of this century. "This auspicious event, which posterity will regard as the culmination of a process initiated, half a century ago, in the capital city of Japan ... marks the opening of the second chapter in the history of the evolution of His Faith in the North Pacific area. Such a consummation cannot fail to lend a tremendous impetus to its onward march in the entire Pacific Ocean ..."
Since that time National Spiritual Assemblies have also been firmly established in Korea and Taiwan. Hokkaido, the site of this Conference, first heard of the Teachings less than fifteen years ago, and the first aboriginal peoples of this land accepted Bahá'u'lláh just over a decade ago. Now you are the witnesses to the beginnings of a rapid increase in the number of believers. Peoples in other islands and lands of the North Pacific, including the Ryukyus, Guam, the Trust Territories, the western shores of Canada and Alaska and the Aleutians are also enrolling under the banner of the Most Great Name, and next Ridván yet another pillar of the Universal House of Justice is to be raised in Micronesia. We are heartened at the prospect that from the indigenous peoples of this vast oceanic area, the Ainu, the Japanese, the Chinese, the Koreans, the Okinawans, the Micronesians, the American Indians, the Eskimos, and the Aleuts vast numbers will soon enter the Faith. The final hours of the Nine Year Plan are fast fleeting. Praised be to God that you have gathered to consult on ways and means of assuring complete victory so that from these outposts the Teachings may spread to those nearby lands where teeming millions have not as yet heard of the advent of this Most Great Dispensation. The sweet perfume of victory is in the air, and we must hasten to achieve it while there is yet time. Vital goals, particularly on the homefront of Taiwan and Japan, remain to be won, and everywhere the roots of the faith of the believers must sink deeper and deeper into the firm earth of the Teachings lest tempests and trials as yet unforeseen shake or uproot the tender plants so lovingly raised in the islands of this great Ocean and the land surrounding it. As you and the friends in the sister Conference in Reykjavik bring this series of eight Oceanic and Continental Conferences to a triumphant close, our prayers for the success of your deliberations ascend at the Holy Threshold. May God grant you the resources, the strength and the determination to attain your highest hopes, and enable you to open a new glorious chapter in the evolution of His Faith in the North Pacific area. To the Bahá'ís of Japan, Naw-Rúz 1974. The emergence of the autonomous Bahá'í Community of Japan signalizes the occasion for a revitalization of the teaching work throughout the Islands. You must now achieve great expansion of the Cause, both in numbers and establishment of its administrative institutions and assume a major role in promoting the spread of the Faith in the Far East. To the National Spiritual Assembly of the Bahá'ís of Japan, Naw-Rúz 1974. We send our loving greetings on your election as the first independent National Spiritual Assembly of the Bahá'ís of Japan. Local Spiritual Assemblies. Another method is for the National Spiritual Assembly to carry out the program in which capable Bahá'ís would be selected in each locality, and would be trained in the teachings so that when they returned home they could offer to share their knowledge with their fellow believers and enhance the functioning of the local community. Both or either of these ways, and any others that can be thought of, may be energetically followed. To the National Spiritual Assembly of the Bahá'ís of Japan, January 25, 1979. The Universal House of Justice has received the newsletter which the Youth Committee of Japan has just started publishing, and asks that you convey to these dear friends its commendation for this effort to reach all the youth on a regular basis to encourage them and keep them informed of developments in the country. It is hoped that this will help stimulate more and more of the youth to move into the forefront of the teaching field and play a truly significant part in setting Japan ablaze with the Cause. To the National Spiritual Assembly of the Bahá'ís of Japan, August 12, 1980. 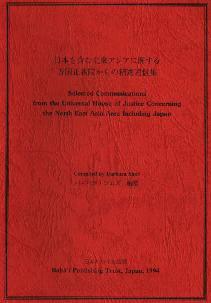 Through the courtesy of the Counsellors of North-eastern Asia the Universal House of Justice has just received a copy of an English translation of the pilgrim notes made by Mr. Hiroyasu Takano concerning his visits with the beloved Guardian in 1954. The House of Justice was very much impressed with the loving spirit with which Mr. Takano relates his pilgrimage experience and the manner in which he expresses his impressions of what Shoghi Effendi said to him. We have been asked to say that, as you know from this and other sources, the Guardian held the Japanese people in high regard, and he foresaw the important part the Japanese believers would play in the unfoldment of the World Order of Bahá'u'lláh. Many of the things anticipated in the statements attributed to Shoghi Effendi in these notes have already come to pass. The high endeavors of the Japanese friends, reinforced by the divine confirmations which these efforts will attract, will no doubt pave the way for the fulfilment, in the not-too-distant future, of all the aspirations of the beloved Guardian for the Japanese community. It is the hope and prayer of the House of Justice that the account of his experience given by Mr. Takano at your last Convention will have a profound effect on the friends and inspire them to labour indefatigably for the progress of the Cause of Bahá'u'lláh, and that the Japanese Bahá'í community will become an ever-stronger centre of attraction and illumination to the peoples of Asia and the Pacific. To the Bahá'ís of Japan at the assignment of the three-year long second phase of the Seven Year Plan, January 1981. In his last letter to the Bahá'ís of Australia in July 1957, the beloved Guardian spoke of the establishment of a "spiritual axis, extending from the Antipodes to the northern islands of the Pacific Ocean--an axis whose northern and southern poles will act as powerful magnets, endowed with exceptional spiritual potency, and towards which other younger and less experienced communities will tend for some time to gravitate." At that time there were but four National Spiritual Assemblies in eastern Asia and the Pacific. Now there are no less than twenty-five pillars of the Universal House of Justice in this area. The number of Local Spiritual Assemblies has risen to more than sixteen hundred; the Mashriqu'l-Adhkár of the Antipodes has been dedicated in Sydney and the Mother Temple of the Pacific Islands will soon be erected in the country whose reigning monarch has embraced the Faith of Bahá'u'lláh. Witness the potency of the power released through the establishment of that spiritual axis! To the Friends gathered in the Asian-Australasian Bahá'í Conference in Canberra, September 2, 1982. These are momentous times. The institutions of the old world order are crumbling and in disarray. Materialism, greed, corruption and conflict are infecting the social order with a grave malaise from which it is helpless to extricate itself. With every passing day it becomes more and more evident that no time must be lost in applying the remedy prescribed by Bahá'u'lláh, and it is to this task that Bahá'ís everywhere must bend their energies and commit their resources. New conditions now present themselves making it easier to accomplish our purpose. Galvanized by the fires of fierce opposition and nurtured by the blood of the martyrs, the forces of the Cause of Bahá'u'lláh are, at long last, emerging from obscurity. Never before in history has the Faith been the subject of such universal attention and comment. Eminent statesmen, parliamentarians, journalists, writers, educators, commentators, clergymen and other leaders of thought have raised their voices and set their pens to expressions of horror and revulsion at the persecutions of our brethren in Írán on the one hand and to paeans of praise and administration of the noble principles which motivate the followers of the Most Great Name on the other. "A responsibility, at once weighty and inescapable, must rest on the communities which occupy so privileged a position in so vast and turbulent an area of the globe. However great the distance that separates them; however much they differ in race, language, custom, and religion; however active the political forces which tend to keep them apart and foster racial and political antagonisms, the close and continued association of these communities in their common, their peculiar and paramount task of raising up and consolidating the embryonic World Order of Bahá'u'lláh in those regions of the globe is a matter of vital and urgent importance which should receive on the part of the elected representatives of their communities, a most earnest and prayerful consideration." These guidelines, penned a quarter of a century ago, are as valid today as when they were written, and can be taken to heart by all Bahá'í communities on either side of the axis. To the National Spiritual Assemblies of the Bahá'ís of Australia and Japan, September 20, 1982. The Universal House of Justice was very happy with the Spiritual Axis program at the Bahá'í International Conference in Canberra and has asked us to convey its warm commendation to you. It was particularly pleased to note the attractive brochure, issued jointly by your Assemblies, which brings to the attention of the friends quotations concerning the roles of Japan and Australia and the significance of the spiritual axis in the development of the Faith in the entire Pacific region. The large attendance of friends from Japan at this Conference was also a source of joy to the House of Justice. It is the ardent hope of the House of Justice that the friends from your communities, motivated by the high spirit generated by the Canberra Conference and continually encouraged by your institutions, will provide a constant stream of travelling teachers to those islands in need of assistance throughout the Pacific. The House of Justice continues to remember your assemblies in its prayers at the Holy Shrines that you will be guided in all your efforts to serve the Cause of God. To the Bahá'ís of Japan, Ridván 1984. On the occasion of this joyous Ridván Festival the Bahá'í world enters the third and last phase of the Seven Year Plan. A renewed spirit of enthusiasm has pervaded the much-loved Japanese Bahá'í community since the International Conference at Canberra where you were represented by a large delegation and effectively presented the results of your study concerning the implications of the spiritual axis joining your country with the Antipodes. Your systematic and earnest endeavours to fulfil the goals entrusted to you have been noted. Among your accomplishments have been the intensification of the teaching and consolidation work in the Ryukyu Islands; and the efforts to establish cordial relations with prominent people, including the proclamation of the Faith to members of the Japanese Parliament. You are urged to provide for the further growth and consolidation of the Japanese Bahá'í community, and to this end you should continue to pursue the ongoing goals assigned to you during the second phase of the Plan, particularly directing your efforts toward increasing the number of active and deepened followers of the Greatest Name from all strata of society; encouraging Bahá'í families to become spiritually united and to be outstanding examples of the ennobling influence of the Bahá'í Revelation; and steadily increasing the number of firmly grounded, actively functioning Local Spiritual Assemblies which promote the healthy growth of their communities and guide the friends in their service to the Cause. Moreover we call upon you to act as a source of leadership and strength for the developing communities on both sides of the spiritual axis, particularly those in the vast Pacific basin. Bearing in mind the implications of that axis you should collaborate with the National Spiritual Assembly of Australia and the respective National Spiritual Assemblies in arranging and implementing teaching, consolidation and development projects in Pacific island communities. Together with the National Spiritual Assembly of Australia you should assist the National Spiritual Assembly of the Caroline Islands to carry out projects to strengthen that Bahá'í community in preparation for the establishment of the National Spiritual Assembly of the Western Caroline Islands at Ridván 1985. Be assured of our loving prayers at the Holy Shrines that Bahá'u'lláh will guide, assist and sustain your endeavours to advance His Cause by winning outstanding victories now within your reach. To the National Spiritual Assembly of the Bahá'ís of Japan, February 3, 1985.
history of the Faith to teach the Chinese people wherever they may reside in the world. This stems from several considerations, among which are the following. Both `Abdu'l-Bahá and the Guardian laid special stress on teaching the Chinese. `Abdu'l-Bahá went so far as to say that China is the country of the future. The Chinese people form the largest single group in the world -- over one-fourth of the world's total population residing in mainland China alone. People of Chinese origin residing in other parts of the world have proved to be very receptive to the Teachings, particularly in southeast Asian countries such as Malaysia and Vietnam. Since present conditions in the People's Republic of China make it extremely difficult for its citizens to become Bahá'ís, it is urgent that at this time we do all we can to teach Chinese people in other countries. The International Chinese Teaching Committee ... was created to assist in this work. Demographic information at the World Centre indicates that there are approximately 60,000 people of Chinese descent in your country. The House of Justice has therefore asked us to urge you to appoint, if you have not already done so, a National Committee whose principal functions will be to encourage teaching the Chinese people and to keep in close touch with the World Centre, sharing information on current teaching activities with it and the International Chinese Teaching Committee. To the Bahá'ís of Japan, Naw-Rúz 1986. At this significant hour in the history of our beloved Faith we stand at a turning point between the Seven Year Plan and an even more challenging Six Year Plan. An air of excitement pervades the Bahá'í world community as it embarks on a new planning process to chart its course looking toward the Holy Year beginning at Ridván 1992. Your National Assembly, in consultation with the Counsellors in Asia, will be formulating the national goals for the new Plan. Delegates to the National Conventions are called upon to make their contributions to the setting of goals and objectives. During the course of the Seven Year Plan a new spirit has emerged in the Japanese Bahá'í community which, amplified and spreading, can decisively influence the growth and development of the Faith in the years immediately ahead, not only in Japan itself, but in all eastern Asia. `Abdu'l-Bahá dearly loved the Japanese people. He said, "The fire of the love of God shall assuredly set Japan afire." He sent them Agnes Baldwin Alexander, whom the beloved Guardian elevated to the rank of a Hand of the Cause of God in the latter years of her long and devoted services to the Faith in Japan. What bounties have been shed upon your beloved country; what a radiant future glows with the rays of the rising sun! The awfulness of that tragic event at Hiroshima which exacted such a dear price from your people is at long last dawning on the consciousness of mankind. The futility of war is clear. The yearning for peace is everywhere apparent. The Bahá'ís of Japan should therefore be in the forefront in paving the way to that oneness and wholeness of human relationships which will produce the conditions for peace. As you now set sail on your new course we urge you to look to the future. Your victories during the Seven Year Plan will provide strong currents to carry you towards your next ports of call. If any hopes were not realized, this will provide challenges for the days ahead. Strong winds of opportunity will blow; make the most of them. Rough seas will cross your course; be prepared for them by deepening your knowledge of the Teachings. Rely upon the Covenant of God, continue your good work, pray for success and the victory will be yours. We shall offer ardent prayers at the Holy Shrines on behalf of the dearly loved Bahá'ís of Japan. To the National Spiritual Assembly of the Bahá'ís of Japan, March 1, 1987. The beloved Guardian, in his 19 July 1957 letter to the National Spiritual Assembly of Australia, described Japan as "...the Vanguard of His hosts in their future spiritual conquest of the main body of the yellow race on the Chinese mainland ..." The Universal House of Justice feels that the Bahá'ís of Japan will, in due time, make great strides in bringing the message of Bahá'u'lláh to the Chinese population. To an individual in Japan, February 15, 1988. The House of Justice is very happy to learn about the teaching work in Japan. The dearly loved believers in that country have a very great mission to perform, and it is therefore necessary and important that the Bahá'í community be greatly strengthened. There is much in what you say about the correct approach to teaching since the history and culture of Japan are much different from those of the West, and, unfortunately, much of our literature is written from the Western viewpoint. To an individual in Japan, August 11, 1988. The House of Justice has been delighted with the news of the proclamation activity which has been taking place in Japan, particularly through the medium of Peace Expositions in shopping malls, resulting in a number of enrollments. The concept of mass teaching may be better understood if put in the context of "teaching the masses". This implies reaching every level of society in every continent and island in the world. In developing countries large segments of the population have become Bahá'ís, usually among the less educated. More recently, particularly in Asia, we see that the youth in high schools and colleges have been attracted to the Faith in large numbers. This does not mean, however, that there is any particular system of teaching which individual Bahá'ís should pursue. Different cultures and types of people require different methods of approach. While taking the fullest advantage of a workable method in one area, the friends should be open to other methods and not blindly insist upon doing the same thing everywhere. If such flexibility is understood, the Japanese community will surely grow in numbers and strength. To the National Spiritual Assembly of the Bahá'ís of Japan, April 19, 1989. Efforts should also be made to increase the awareness of the Bahá'í youth to the importance of meeting Chinese people at school and at work. Furthermore, they should be encouraged to take up studies in the Chinese language and culture when possible and to specialize in their respective professions on aspects relating to China. Bahá'í scholars and experts on China are needed to assist in establishing the Faith in China. Increasing emphasis must also be placed on the teaching work among Chinese who have been long settled in your country as well as those who are students or long-term visitors from places with large Chinese populations such as Hong Kong, Macau, Malaysia, Singapore, or Taiwan. To the National Spiritual Assembly of the Bahá'ís of Germany (copy to National Assembly of Japan), September 24, 1989. The opening of Sakhalin is one of the goals of the National Spiritual Assembly of the Bahá'ís of Japan, and the House of Justice is very pleased that it is a pioneer from Japan, Mrs. Beth McKenty, who has been able to make the first visit of a Bahá'í to the island. Telex to the National Spiritual Assembly of the Bahá'ís of Japan, March 27, 1990. Rejoice settlement Sakhalin by Knights of Bahá'u'lláh Abbas and Rezvanieh Katirai, thus completing opening all virgin territories Ten Year Crusade, attaining goal entrusted Japanese Bahá'í community on inauguration Nine Year Plan. Assure Sakhalin Committee and valiant pioneers and travelling teachers ardent prayers sacred Threshold divine confirmation their highly meritorious services. Lovingly congratulate your National Spiritual Assembly and entire Japanese community on this historic achievement. To an individual in Japan, March 6, 1991. Each of the teaching methods being utilized within the Japanese community possesses its own strength. The individual teachers should be encouraged, therefore, to follow the teaching methods for which they feel best suited, as the importance lies in the spirit, effectiveness and devotion with which this work is carried out. The Cause of Bahá'u'lláh should, of course, be conveyed accurately, in unadulterated form, and in accordance with the capacity of the listener. Hopefully, active teachers will learn from each other new ways to enrich and diversify their approaches to best reach their audiences. When receptive souls have recognized Bahá'u'lláh as the Manifestation of God for this age, the Bahá'í institutions and members of the community should warmly welcome these new believers into the Bahá'í fold, seek to expand their as yet limited understanding of the Cause, and execute practical plans to deepen and assist them in becoming torchbearers of the Faith. The Japanese believers have learned from their past experiences and their community has progressed significantly during recent years. The spiritual and administrative growth necessarily entails hardships and tests. It is true that language barriers or a lack of literature present obstacles in the work of any community. However, it should be remembered that the Bahá'í community in Japan has developed in an era when even a meager amount of literature or facilities was not available. To the Local Spiritual Assembly of the Bahá'ís of Kurume (Japan), May 21, 1991. Fund offered in the name of your dear departed friends, Shojiro Ogata and Hiroshi Fujii. This loving act in their memory is indicative of the solidarity among the members of your community, who may be assured that their gift will bring happiness to the immortal souls of these two believers and that it will be a cause of their progress in the Kingdom of Eternity, as promised in our Writings. The House of Justice will offer prayers at the Sacred Threshold on their behalf, as well as for the welfare of their bereaved families. To several individuals in Japan, February 5, 1992. Your letter dated 29 December 1991 was received and the Universal House of Justice was touched by the loving messages and drawings from the Bahá'í children who had come together during their winter vacation to study the life of Bahá'u'lláh with their parents. There is no doubt that such an exercise will serve to give them a firm foundation in the fundamental verities of the Faith. It is hoped that the seeds of faith and knowledge sown in the hearts of all of the participants will indeed flourish and contribute to the development of Bahá'í scholarship in Japan. It is hoped that many more Bahá'í families in Japan will have opportunities to become involved in such worthy endeavors. To an individual in Japan, March 19, 1992. Your dear father has forwarded to the Bahá'í World Centre a copy of your article about the Faith which was published on the first page of a Buddhist newspaper, accompanied by photographs. The Universal House of Justice was delighted to see this and has asked us to state that writing such articles is a very important service to the Faith, particularly at this stage, when it is emerging from obscurity in most parts of the world. This presents opportunities for proclaiming the Faith in the media which were undreamed of only a few years ago, and the Japanese believers should be fully conscious of this fact and take advantage of it. The House of Justice hopes that you will not only continue writing such articles yourself, but that you will also inspire your fellow Bahá'ís in Japan to do likewise, and to assure them that, if they only try, Bahá'u'lláh will confirm them in their endeavors. The House of Justice wishes us to express its appreciation for your efforts in this field and to assure you of its prayers in the Holy Shrines on your behalf. The newspaper article will be kept in the Bahá'í World Centre Library. To the National Spiritual Assembly of the Bahá'ís of Japan, August 24, 1992. The House of Justice was pleased to see the determination with which you have pursued your Plan, and the numerous victories you have won for the Faith during this period are a source of happiness to its members. In particular, the fact that you were able to form 20 Local Spiritual Assemblies during the last 12 months of the Plan, thus winning your goal of 65 Assemblies by the end of the Plan, is considered quite remarkable in view of the slow progress in this field in previous years. The other significant achievements in propagating the Faith are the opening of all prefectures of Japan and the opening of Sakhalin Island, the last virgin territory of the Ten Year Crusade. The progress you have made in publishing Bahá'í literature is highly appreciated, as are your ongoing efforts to consolidate your community and foster the development of Bahá'í community life. The increase in the number of Bahá'í children's classes held and the establishment of Bahá'í clubs in three universities, as well as the formation of a "Bahá'í Women's Network" augur well for the budding strength of the Faith in Japan. All of these gains were achieved through the devotion and sacrifice of the believers in Japan and through their reliance on the assistance from on high. The experience gained in the formulation of this Plan and in its implementation during the last six years will have provided your National Assembly, as well as all other Bahá'í institutions in Japan, with valuable insights into the dynamics of systematic propagation and consolidation of the Cause and an appreciation of the capacities latent in your community, and this will be very helpful to you as you chart the course of the future development of the Cause in Japan. The evidences of the spiritual potency of the Holy Year are already manifest throughout the world as the Bahá'ís are being confirmed in their services to the Cause in much greater measure than ever before. You are urged, therefore, to seize the opportunities with which the Hand of Omnipotence has invested this special time in the history of our Faith, confident that the sustaining grace and guidance of Bahá'u'lláh will surround you in all your devoted endeavours. We are to assure you of the loving prayers of the House of Justice in the Holy Shrines that the followers of the Greatest Name in Japan may arise to meet this challenge and to achieve such victories as would be a fitting gift to lay at the Threshold of their Beloved.